How do design and designing participate and reinforce power structures in an intersectional way through and across race, gender and class? How can design and designing offer novel ways to understand the ways in which power operates in intersectional ways? And possibly how can design and designing propose ways of intervening in such complex and intersectional power relations? 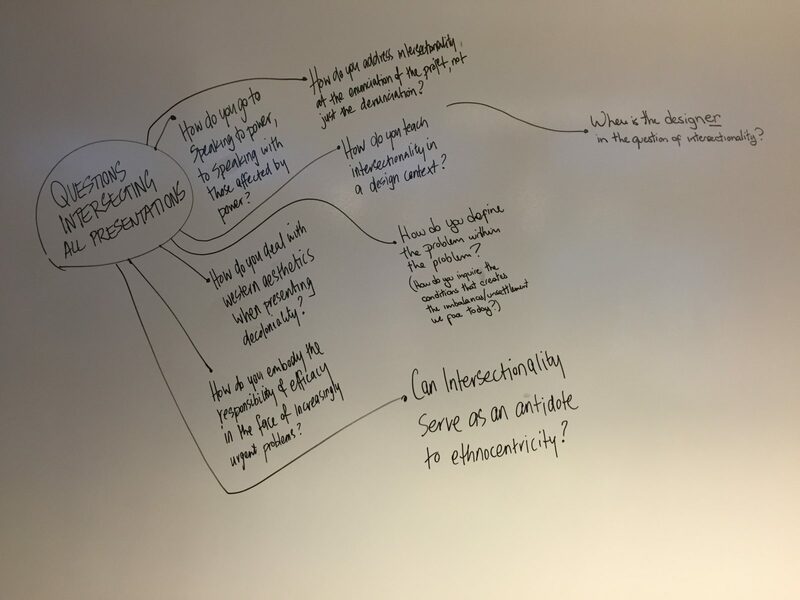 These are the questions that the Decolonising Design group asked in the call for papers they issued for a 2-day symposium in Malmö, Sweden: Intersectional Perspectives on Design, Politics, and Power. As someone who came to political consciousness via “post”-colonial feminism while my design education swallowed the so-called internationality of Swiss modernism wholesale, I was excited and intrigued about the questions being raised around intersectionality, coloniality, and design. This presentation will introduce the Design Justice Network, a community of design practitioners and community organizers who are urging the design field to engage in critical discourse about how this work perpetuates injustice, and how we might bring justice to design. It will outline the Principles for Design Justice, a collectively written and edited document that underpins the efforts of the Network, and will use these principles as a framework for understanding the design story behind Feathers of Hope: Justice and Juries, a community development initiative centred around Indigenous youth in Canada. 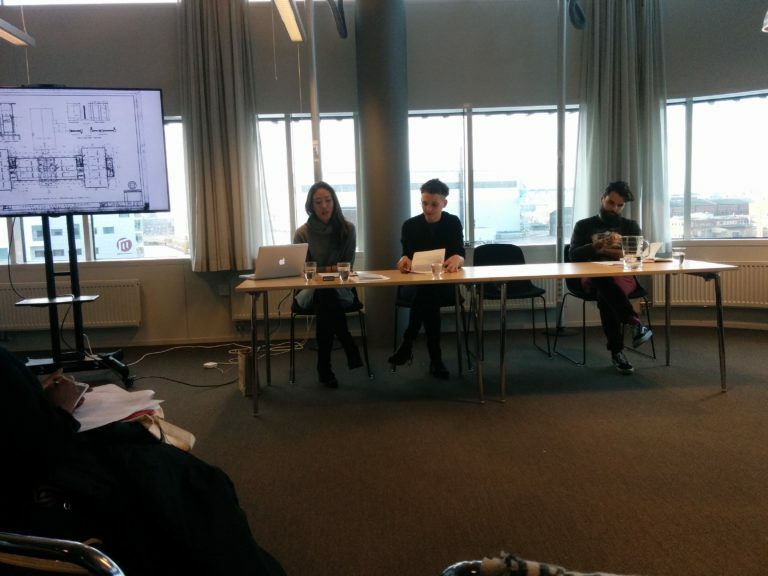 Being a design research conference, my co-presenters’ talks were much more theory and criticism oriented than my own. I appreciated this opportunity to absorb knowledge I don’t normally have access to; in particular Paola Pierri’s grounding of designing for mental health in Mouffe’s agonism and Joanna Boehnert’s application of Bordieu’s conception of symbolic power and violence to the practice of design. However I couldn’t help feeling a certain discomfort coming away from the symposium. For one, there was a noticeable gap between the design research being conducted in academic institutions and the people and communities being researched. For a gathering focused on undoing colonialism in design and through design, I was surprised that the majority of presenters were white Europeans and settlers. Although the talks addressed subjects like sweatshop labour in China, the popularity of skin-lightening creams in Africa and Asia, and dehumanizing design of toilets in South Africa, the voices and agency of people who live these realities were for the most part missing or muted. Another source of discomfort for me was the focus on critical design projects. While they were all incisive and well executed, I really had to question how far the creative production of critique can take us. As some of the presenters pointed out, platforms for this work are limited to gallery and museum spaces, and as we know, these are contexts that have historically excluded and stolen from colonial subjects. Can critical design be made accessible outside of these spaces, particularly when the inspiration and knowledge for these works is taken from excluded communities? And, is criticality enough? I felt a bit alone in the belief that design can be critical while also being visionary; that it can point at problems implicitly by building explicitly alternative solutions. Especially now, in a moment where the idea of a Trump presidency might have been considered speculative fiction not long ago, I think we must utilize our radical imaginations not just to critique but also to heal, to create joy, and to build the world we want — and need — to live in. Two talks pointed to these alternative worlds. Dori Tunstall, Dean of Design at OCADU in Toronto, spoke about that institution’s new commitment to decolonizing education. And perhaps most instrumentally, Dimeji Onafuwa presented some early reflections on workshops about allyship for design researchers at Carnegie Mellon. I’m excited by the potential that allyship opens up for critically engaged design, as it acts as a check on the concerning dynamics I mention above. I am certainly grateful for the questions the symposium left me with, and for the opportunity as a practitioner to connect with researchers. I’m very much looking forward to seeing how design discourse evolves in response to critical collisions like these.